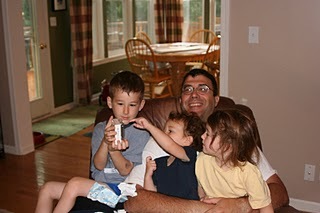 Yesterday we celebrated Father's Day for hubbie. The day itself was pretty uneventful, just like any other Sunday. Wake in the morning, clean a bit, showers, church, grocery shopping, more cleaning (me, of course), kiddies to the park (that's hubbie) and dinner. I grilled (and yes, I do the grilling, hubbie pokes, prods, turns and messes with the meat too much) lamb steaks and they were delicious! I am tired today as we had an enormously busy weekend. Saturday morning both girls have an Art class, one class right after the other. Son had rock climbing and his last soccer game. We were going nonstop from the time we woke up. After soccer I was able to go the nail salon and get my nails done, three weeks this time. I'm way to busy to have these nails any longer! But I think I will die before I take them off (yes, they are fake!) My brother and nephew came down after lunch. My brother tied down a tree that was leaning in our yard (he is an Arborist, Tree Trimmer and all that entails-he works for the power company trimming trees along the power lines). Kids and cousin had a great time playing all afternoon and evening. We all went out to dinner, yummy dinner as well. The children all behaved very nicely. I am off now to T-Ball and a promised play time at the park and then more errands this afternoon. As you can see from the picture, hubbie was happy! We bought him an iPod Nano. He was extrememly happy because I am very cheap and never spend money on new gadgets, EVER! I think it a complete waste of money. I am not one for having the newest or the latest of anything technical. This kills my hubbie (engineer-computer geek that he is), so for his to get a Nano from me is HUGE!! What can I say, I was pressed for time, I had three kids with me, it caught my eye, I was drunk shopping (that one totaly kidding), I don't know, just bought it for him. He loved it, so that is what matters I guess. Hey it's his money right?